Cameo is a flat themed responsive admin template powered by the awesome Twitter bootstrap 3 front-end framework. It comes packed with a plethora of ready to use components and plugins and can be used in the creation of admin dashboards, CRM or CMS panels. It is clean, fully responsive, well documented and is easy to modify or style to meet your needs. 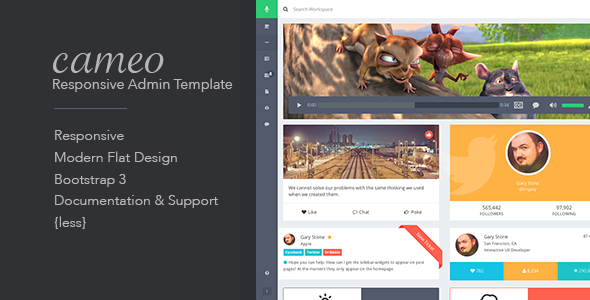 Item Reviewed: Cameo - Bootstrap 3 Responsive Admin Template 9 out of 10 based on 10 ratings. 9 user reviews.